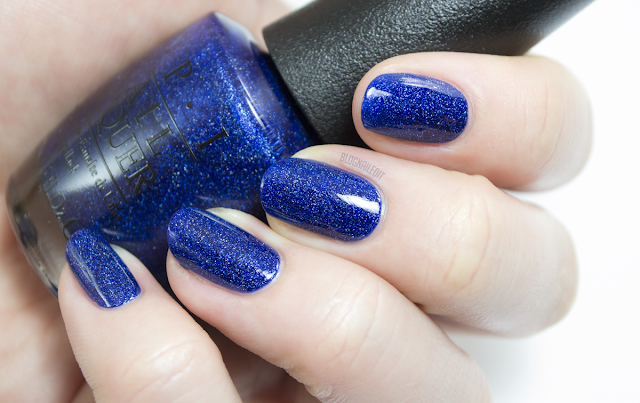 OPI has two fabulous new collections coming in (the Hello Kitty collection and the New Orleans collection), but my favorite 2015 release might have to be what I'm sharing with you today - the Starlight collection. This huge, 18-piece collection is chock-full of amazing glitter, chrome, and even some holographic. I'll let the collection do most of the talking, but I have a few things to call out. First, some of the glitters are...strange. A few of the chromes have glitter buried in them, which come out looking odd. To me, it looks like someone accidentally got glitter or dirt trapped in their polish and just left it that way. Not my favorite look. That being said, it might be perfect for someone else, so I'll just give my honest review as always and let you make your own decisions. To start the swatches, here's a fun "Starlight-inspired" look and name. Everything seems to have some ties to space, so I'm calling this "Melting Moon". Melting Moon was created with two Starlight shades - I Drive a Supernova and I'm in the Moon for Love. First, I created a half-moon shape at the base of the nail with a small detailing brush. Then I brushed up toward the tip of the nail in small little strokes. Super simple! Now strap in for all 18 swatches from Starlight, and be sure to let me know which is your favorite! By the Light of the Moon (2 coats) is one of those weird, buried glitter chromes that I just can't get my mind around. The glitter is all large, hexagonal shaped, and it's paired with a silver chrome. Two coats is plenty for coverage, so that's good. As much of a disappointment as By the Light of the Moon was to me, Ce-Less-tial is More (2 coats, no top coat) is a home run. The dense glitter mix is rosy-gold with...wait for it...rainbow glitter too! You're looking at 2 coats with no top coat. 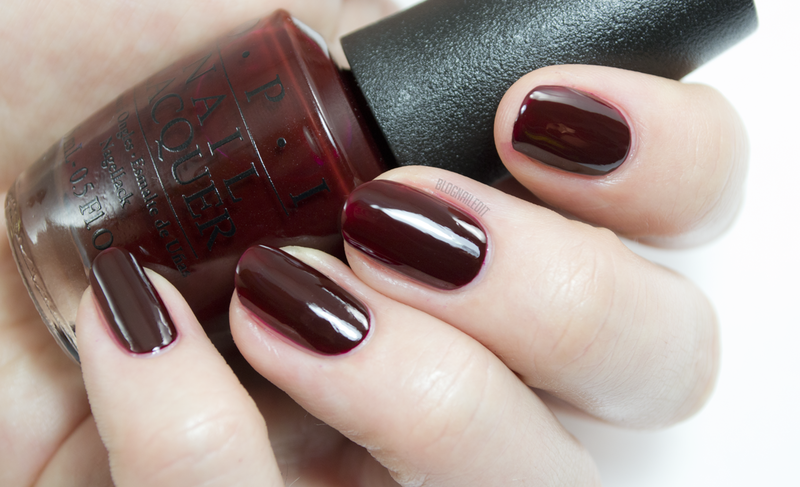 I love this one, especially in gel because then you lose the chunky, gritty texture that you get in regular lacquer. The darkest shade of the collection also happens to be fabulous. Center of the You-niverse (2 coats) is a charcoal jelly with silver micro glitter and little flecks of matte black glitter. It has a bit of texture to it, but a top coat wipes it out for the most part. 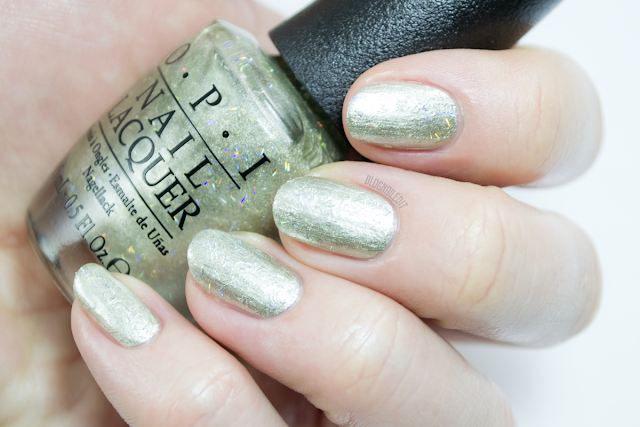 Comet Closer (2 coats) is a statue-of-liberty-esque tarnished silver chrome with just a bit of additional micro glitter for texture. The micro-glitter matches the shade of the chrome perfectly. 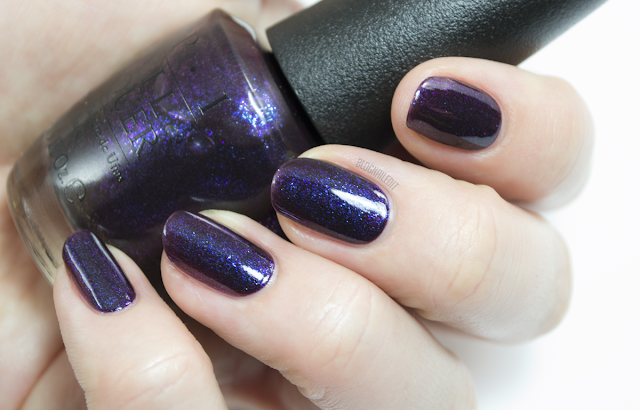 Cosmo with a Twist (2 coats) is a deep, dark purple jelly with blue and purple iridescent shimmer. It's a little patchy with just one coat, but it builds up well, as you can see in this two-coat swatch. Give Me Space (2 coats) is by and large my favorite color from Starlight. The polish is a royal dark blue holographic with insane coverage. I've already convinced at least one person who wasn't planning on buying this that they couldn't live without it. Trust me, you can't. You'll "literally" die without it. Guys & Galaxies (2 coats) is also a striking color, in a very different sense. This creme is a rich brown-red...very sultry! I Drive a Supernova (2 coats) is no surprise for a winter collection. A simple, silver chrome with good coverage. It seems that OPI hasn't been able to figure out the streaky chrome problem, but I don't think anyone has. 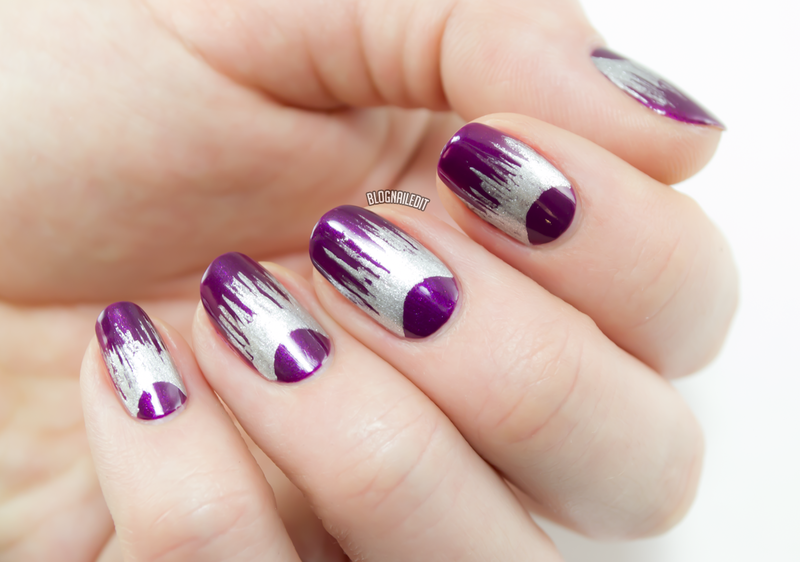 If I'm wrong, direct me to a chrome polish that doesn't leave stroke lines. I'm in the Moon for Love (2 coats) is a lovely plum purple with just a hint of gold shimmer for accent. I love how smooth this one is. Now here's a glitter that's not for everyone. Infrared-y to Glow (1 coat over OPI Don't Burst My Bubble) is a glitter mix with pink and gold chevron slices as well as smaller hex pieces of holo glitter. Very strange shape, but I like the end look of the two polishes I paired for this swatch. 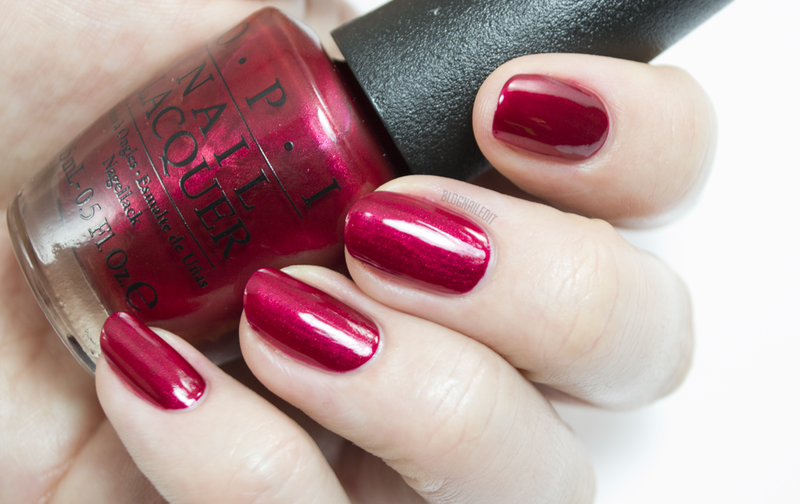 OPI - Is This Star Taken? I'm sorry OPI, I'm sorry everyone else, but I really don't like this polish. It looks like Poseidon shaved his beard and his magical rainbow beard stubble got caught in the paint of his scepter. I just don't like Is This Star Taken? one bit. Rainbow bar glitter should be left alone, not buried in tarnished silver chrome. 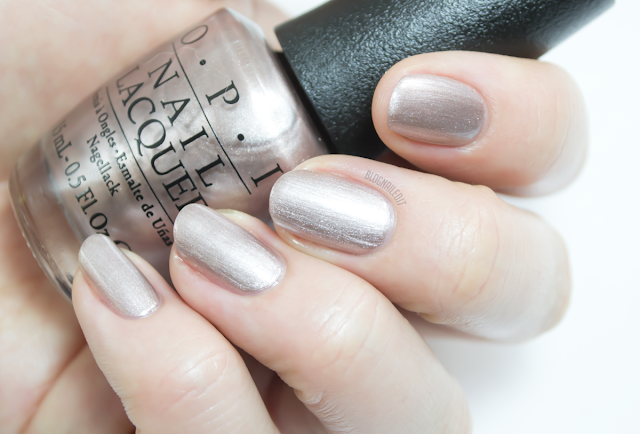 Let Your Love Shine (2 coats) was a popular color for Christmas. 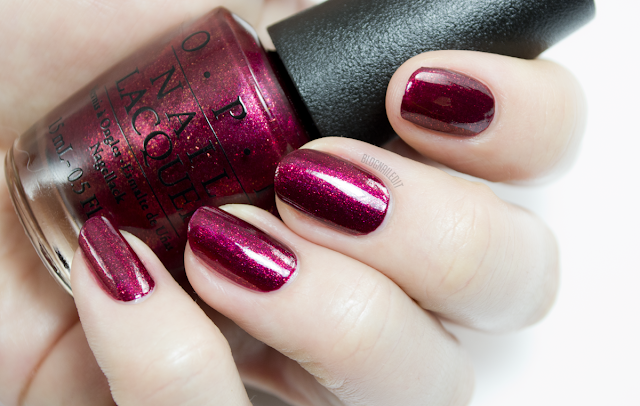 It's a dark red shimmer with cherry red and gold shimmer sprinkled throughout. It doesn't leave a gritty texture though! Love is in My Cards (2 coats) is now one of my favorite reds. I used it in my "Hell of a Lot of Holiday" manicure, but I think it speaks for itself. It's just the perfect cherry pie red creme. Great coverage and color. 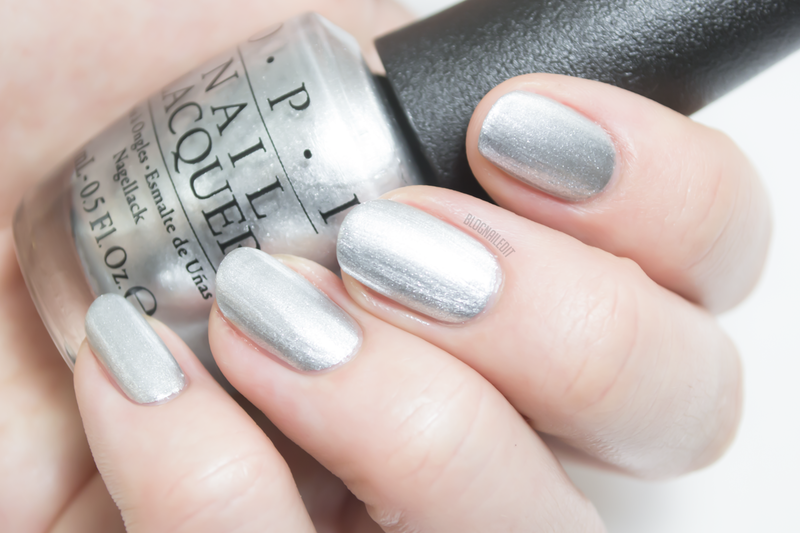 No More Mr. Night Sky (2 coats) is a great charcoal grey jelly with blue and silver micro-glitter. No grit to this polish's texture either. Rose gold seems to be a popular choice for jewelry and chrome accents alike, so why not turn it into an even more popular polish color? Press * For Silver is named incorrectly, because it truly is more of a rosy gold than silver. Ro-Man-ce on the Moon (2 coats) is a cherry pie chrome that shines up beautifully with top coat. I bet this one would be perfect matte too. 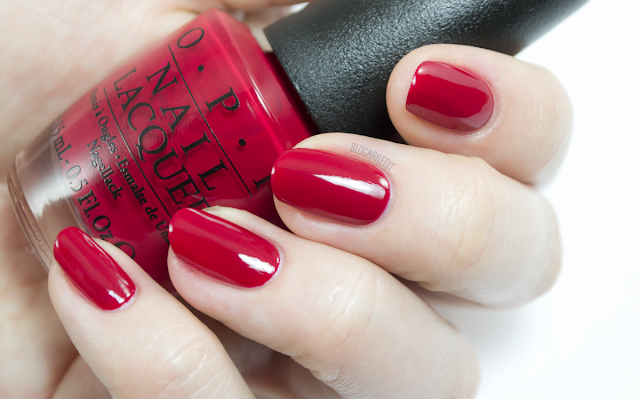 Super Star Status (2 coats, no top coat) fits its namesake. I honestly couldn't stop staring at my nails with this on, much like us plebeians can't stop staring at celebrities in the wild. It's a dense silver glitter mix with large pieces of white gold hex glitter. While wearing it, you don't notice the gold as much, but in photos it shows up clear as day. 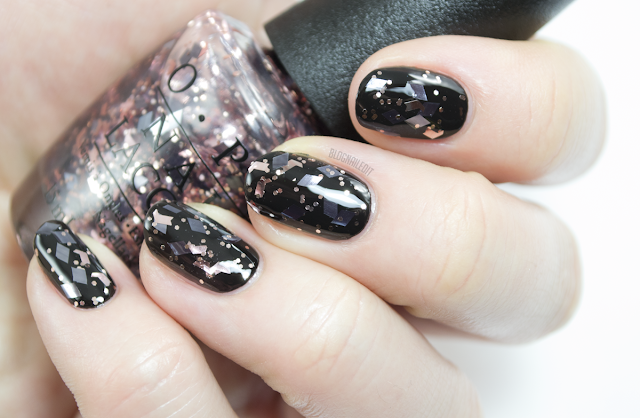 Two Wrongs Don't Make a Meteorite (1 coat over OPI Black Onyx) is the last in the collection. (Have you even read this far? Is anyone even reading?) 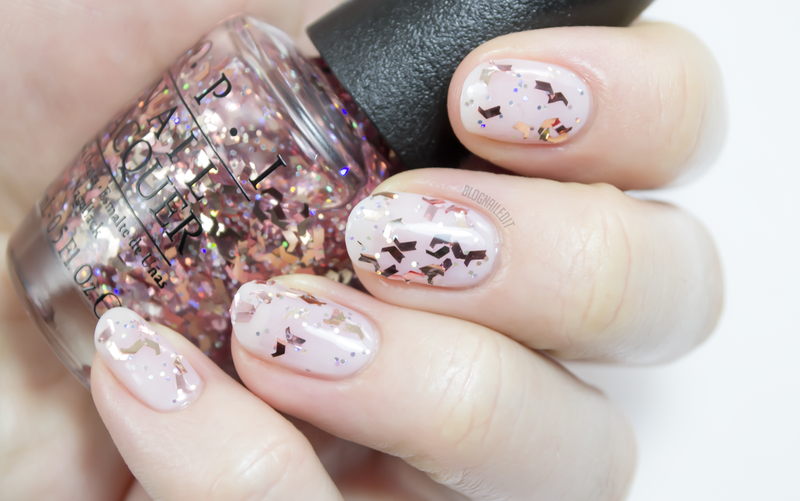 This polish is a barely-there pink jelly base (mainly clear) with pieces of glitter that include silver diamonds, chopped pink chevrons, and small pink hex. Add this on top of any color to jazz it up big time. Even though this collection hasn't been out long, people are already finding it hard to pick up colors they've been hunting for, so if you're digging anything, go out and grab it! Bahaha, I read the whole thing! Cracked up at your description for "Is This Star Taken?" Reminds me of "Pineapples Have Peelings Too." Exactly! Poor Pineapples...it's probably one of the most hated colors.